Caffè Tropea is a family run Anglo / Italian restaurant nestled in the beautiful surroundings of London's Russell Square. Indepedent since it opened in 1981, they approached Elmwood London with a request to refresh their visual identity and draw on their rich heritage. Having set upon the concept of a T brand mark, Elmwood needed some help from a lettering specialist and invited Jordan Metcalf to work on the project. The finished T shape is made up of intricate illustrated details which tell the story of the families’ heritage, love of food and their home town in Italy. Stunning work. We’ve been very fortunate at Handsome Frank to work on a variety of amazing jobs over the past year. One that really stands out in particular though was the honour of working with National Geographic on a cover commission, as we did back in May. 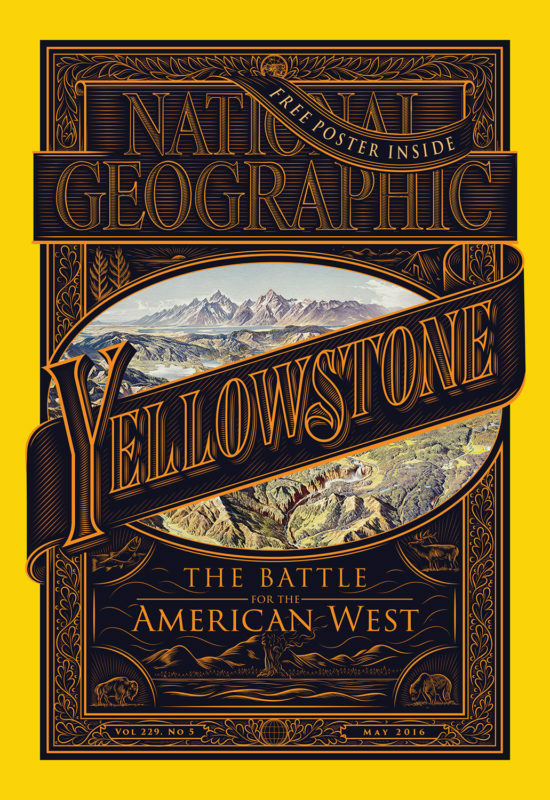 The issue was entirely focused around the world-famous Yellowstone National Park and the team were keen to explore a typographic approach for the cover. Our very own type wizard Jordan Metcalf set to work on a cover for the magazine equivalent of David Attenborough, and ended up taking inspiration from the aesthetic of an old map of the area provided by the magazine. This map ended up being incorporated into the beautifully crafted final design that also boasts small illustrations as well as decorative patterns and, of course, custom typography. 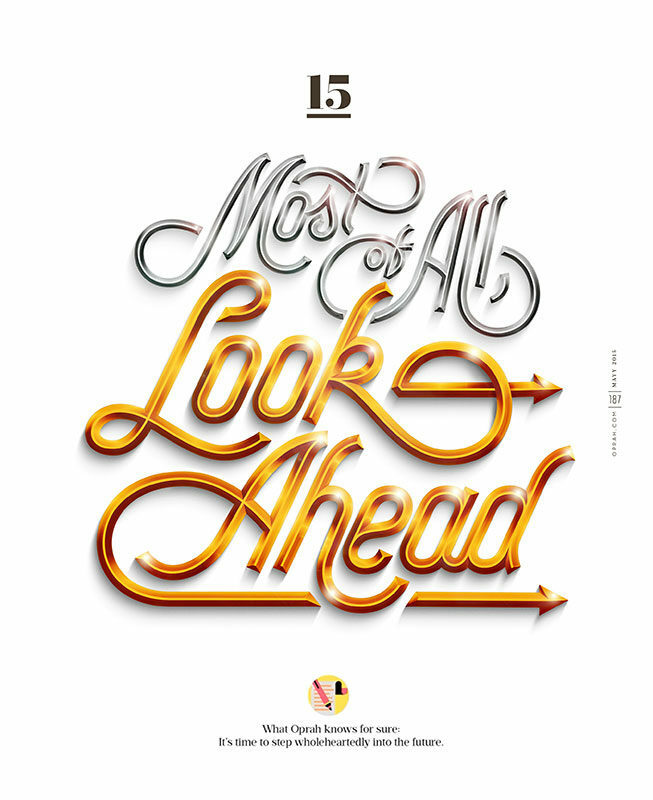 The May issue of Adweek includes a feature titled 'The Power List', it's a feature that ranks 100 media industry movers and shakers based on influence, profits and various other aspects. They knocked on the HF door wondering if a certain Mr. Metcalf could be able to deliver a type treatment which was powerful yet playful to kick the section off.As you can see from the result boy did he deliver. Look at that shading! When the team at O, The Oprah Magazine were putting together their big fifteenth anniversary issue they wanted a number of top typographic illustrators to lend their talents to a particularly special feature that required a quote to be beautifully designed as a full page chapter opener.We are proud to say that HF's Jordan Metcalf was given the privilege of creating the final quote in the section with words penned by none other than Miss Winfrey herself. Needless to say Jordan really hit this one out of the park, behold the printed final. Every year the Washington Post produces a special issue of their Arts section which features the Kennedy Center Honors, a big art event in Washington, DC. Last year the team decided to include broadsheet spreads on each honoree that would contain beautifully shot black and white photography by Jesse Dittmar but would need some equally beautiful typography to accompany and play off the images.Jordan Metcalf was asked to work his magic on the names of the honorees which included Al Green, Tom Hanks, Patricia McBride, Sting and Lily Tomlin. He ended up doing such a good job that he was then asked to take on the title of the section too!